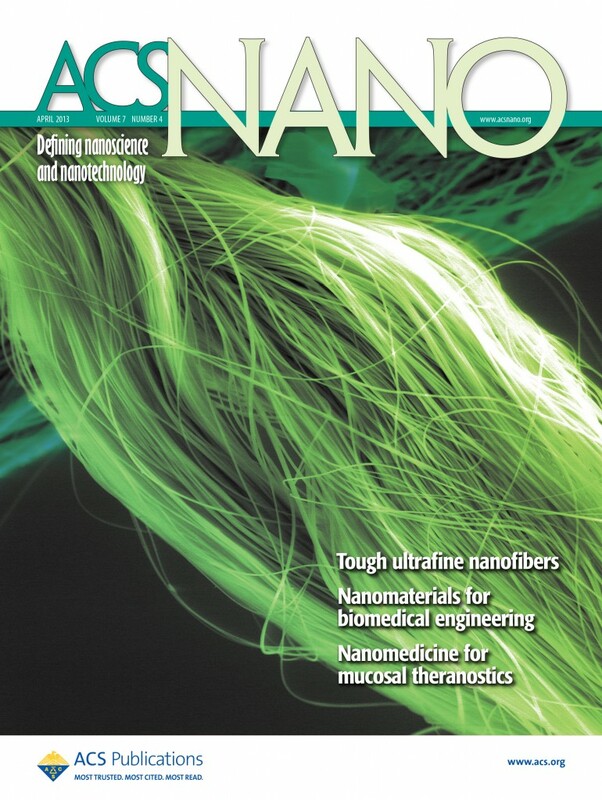 On the Cover: Scanning electron micrograph of continuous polyacrylonitrile nanofibers produced by electrospinning. During electrospinning, high-speed stretching of polymer solution jets is accompanied with rapid solidification of nanofibers. These unique conditions may produce an unusual combination of low crystallinity and high macromolecular orientation. Electrospun polyacrylonitrile nanofibers exhibited extraordinary simultaneous increases in strength, modulus, and toughness with decreases in their diameters. Image courtesy of Joel Brehm, Dimitry Papkov and Yuris Dzenis. Dimitry Papkov, Yan Zou, Mohammad Nahid Andalib, Alexander Goponenko, Stephen Z. D. Cheng and Yuris A. Dzenis. April 2013. Simultaneously Strong and Tough Ultrafine Continuous Nanofibers. ACSNano 7(4), pp. 3324–3331. Yuris A. Dzenis is McBroom College Professor of Materials and Mechanical Engineering, and Alexander Goponenko is a research assistant professor of materials and mechanical engineering. Dimitry Papkov, Yan Zou and Mohammad Nahid Andalib are graduate students in the College of Engineering. Joel Brehm is graphic artist in the Office of Research and Economic Development.